As we get older posture begins to decline in some, but if you take into effect the computer age , poor posture in our society is becoming an epidemic. Just go into our schools and see what our kids look like or pop into your teenagers room while they’re mindlessly staring into the computer. How heavy is your teenagers head getting in the picture to the right? Teens are not the only vulnerable population, you are also. For every inch of head projection, you are putting 10 pounds of extra force on the spine. Two inches is equivalent to putting a 20 weight on top of your head while in a good posture. A group that may be in an even higher risk group is women with breast augmentations. As we posted earlier about the possibilities of breast augmentation leading to hyperkyphosis, now we find a health study from 2009 Annals of Internal Medicine that points to worse possibilities. 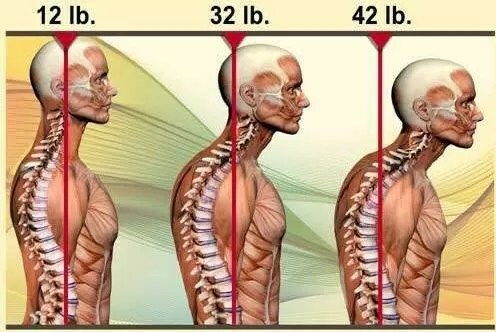 According to the hyperkyphosis study, that just the mere presence of a widows hump/poor posture leads to early deaths without any other issues. Posture can be corrected even in the bad environments, but first you must change the environment. Here is an example of the perfect conceptual computer environment with a base price of $2750 that can easily exceed $10,000 with the comfort package. Your chiropractor can locate and correct spinal misalignment that causes nervous system dysfunction. Dysfunction in the nervous system can lead to poor muscle tone that regulates your posture. He or she can also recommend thing you may change in your environment that are not covered in the blog. Act today, tomorrow is always a day away. How many long term studies have been done on augmentation procedures and what is the efficacy of the procures in long term protocols?